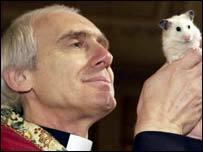 Animals including cats, dogs and even a pet iguana were blessed by a vicar at a special church service. Saturday's unusual event at the Church of St Mary the Virgin in Sedgley, Dudley, West Midlands, marked the day of St Francis of Assisi, the patron saint of pets. Reverend Elizabeth Smith said the service, which began at 1500 BST, was the second at the church, following last year's blessing of 30 pets. Ms Smith said: "We even had an iguana last time. We also had a pair of snails. I encourage people with all types of pets to turn up." Ms Smith, who has two cats of her own, said pets were an increasingly important part of peoples' lives and the Church should try to reflect this. "One of the problems we have in the Church is that we are often seen as out of touch. "People feel very strongly about animals and pets, so I feel this is an important occasion for them."